Words are not just elements of speech or writing, because they can be used to strengthen the effects of magic, which is the art of directing and controlling energy. When spoken out loud, words transform into frequencies and vibrations that can be used to direct energy. This is one of the first steps to creating magic effects. Most people will laugh at the idea of magic being real, but if only they knew what magic really is and how magic is being used to control them, they would not be laughing. The world is dominated by magic. Until you train your eyes to see how magic is used to control you, you will never know how the world really works. The Controllers who pull the strings of politicians are well aware of how magic works. Many of them actually practice the art of magic, which is why they are sometimes referred to as the Dark Magicians. Unfortunately, they like to use magic for power and evil purposes, instead of using it to change the world into a better place. The most powerful thing in the Universe is energy. If you learn how to control and direct this energy, you will become one of the most powerful people on Earth. Why do you think the Controllers (the Dark Magicians) are so obsessed with magic and energy? The word magic is derived from Old French magique, Latin magicus, and Greek magikos. One of the earliest definitions of magic is the “art of influencing events and producing marvels using hidden natural forces”. Magic has a strong relation with magnetic and electrical energy. Did you notice that the word magnetic has the word magic in it? Take out “net” in “mag-net-ic” and you are left with the word magic. The art of magic is often practiced along with certain words and sacred geometries. The common words that are used in magic rituals are the words that produce powerful sound tones when spoken out loud. These sound tones have powerful vibrational patterns, which are used to direct and control energy and harness its power. Sound is able to direct energy for the reason that it carries certain frequency patterns that attract energy to flow in a controllable manner. Furthermore, sound is one of the natural forces used by Nature to create crystalline structures and sacred geometries, which are some of the building blocks of matter. For strong evidence that sound can direct energy, watch the video below. Once you know how words along with sound can be used to direct energy to produce magic effects, you will know that words can be as powerful or even more powerful than swords. When you move the letter “s” in “words” to the front, you get “sword.” This is not an accident. 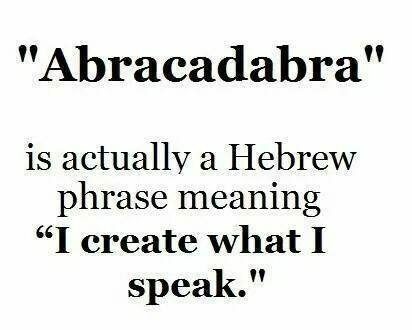 Nearly all words in the English language are carefully designed and put together in a way that produces magic effects, so that the creators (the Dark Magicians) of these words can trick you into playing their “con game.” Is this hard for you to believe? Read further and I will show you the evidence. When you go to court for a trial in the United States, you are not really going to court but are going to a “game arena” where they are planning to con you using “legal words” and trickery. Where do you go when you want to play basketball or tennis? You go to a basketball “court” or tennis “court.” Therefore, a “court” is where people go to when they want to play a game. Did you think they named the place where you go to trial a “court-room” by accident? Once the trial begins, the judge will try to trick you to play the role of the trustee, which is the role of the slave. Why? Because the judge wants you to lose since you are in a game arena and he wants to make money for his master, the Crown Temple. This is why nearly 97 percent of the time people lose against the court and the Crown Temple. The judge tricks you to agree to be the trustee by asking you if you are the legal name, which is the name in all capital letters. This legal name is found on your driver’s license, social security card, birth certificate, etc. For example, if your name is JOHN DOE and you answer yes to being JOHN DOE, then you agree to be a legal person, which is a corporation. This puts you under the jurisdiction of the court. What you should have done instead is tell the judge which role (beneficiary, administrator, or trustee) you are playing in the “game arena” (court-room). If you do not do this, the judge presumes that you are the trustee (slave), so he can make money for his master (Crown Temple). Once the roles are set, it is pretty much game over for you. Now, if you would have told the judge that you are the beneficiary or administrator of the legal person, then it would have been a whole different ball game. Like any game, you better know the rules before you agree to play. Otherwise you have very little chance of winning. Court “games” are serious games because real people do go to jail. If you are too scared to play the game in court by yourself and want to hire an attorney to represent you, do not have too much hope because most attorneys and judges are a bunch of TRAITORS. However, I will have to be fair and say that there are a few judges and attorneys out there who are not traitors. Attorneys are not really there to help you, because they are officers of the court. Their allegiance is to the court and their job is to create revenue for the court. Attorneys are actually foreign agents because they are agents of the Crown Temple, the secret society that controls the Crown of England. Guess who controls the Crown Temple? The Vatican! All licensed BAR attorneys in the United States owe their allegiance and give their solemn oath in pledge to the Crown Temple. This is a requirement to be a member of the BAR association. When American attorneys become a member of the BAR association, whether they realize it or not, they are pretty much spitting on the graves of the patriotic Americans who died fighting the British empire during the American War for Independence. In my opinion, most of these BAR attorneys are TRAITORS and COWARDS and a bunch of SELLOUTS. If you are confused about all this legal stuff, watch the video below and light bulbs should start flashing on like crazy in your head. The video above took place in Canada but it is still relevant to the courts in the United States, Australia, and the United Kingdom. This is because the courts in these countries are operating under Admiralty Law and Maritime Law, not Constitutional Law. This is why judges do not want to hear your arguments about constitutional rights in court. Are light bulbs flashing on like crazy in your head now? If not, you still have a lot to learn because you do not even realize that you have been slaved. Maybe this quote from the movie The Matrix can wake you up. The Matrix is NOT “just” a movie. It was an experiment done by the Dark Magicians to see how the people would react to a movie that was telling them the truth in a metaphorical kind of way. The Dark Magicians like to tell you what they are doing to you or are planning to do to you in movies and TV shows. You want evidence of this? Read this shocking article. When you sign a contract with a corporation or the government, you are agreeing to a fraudulent and deceptive treatise. In other words, you are being conned. The good news is that pretty much all contracts you made with corporations and government agencies are fraudulent since they do not come with full disclosure. For more evidence of how words are used to deceive you, read this empowering article about the secrets of the court system. If all you do is look at the common definition of a word, you will never know the deeper meanings of it. To find its deeper meanings, you need to look below its surface, dissect its layers, and look at it from many different angles. This means that you may need to use an etymology dictionary to find the origins of the word, and split and rearrange the word using the art of anagram. Once you find the origins of a word, dissect its layers, and look at it from many different angles, the true intent and meanings of the word magically become noticeable inside your mind. So, next time you look up a definition of a word, do not only look at it at face value, but also look at its origins, prefix, and suffix. A word that you may want to know its deeper meanings is baptism. When you look at the word baptism carefully and study its definitions to see what other words are associated with it, you should eventually come to the conclusion that baptism is a dark magic spell! a suffix forming adjectives and nouns from verbs, occurring originally in French and Latin loanwords (pleasant; constant; servant) and productive in English on this model; -ant, has the general sense “characterized by or serving in the capacity of” that named by the stem (ascendant; pretendant), especially in the formation of nouns denoting human agents in legal actions or other formal procedures (tenant; defendant; applicant; contestant). Once you know the relationship between the word “baptism” and “covenant,” you will know that when a person is baptized, that person is serving in the capacity of a coven or is making a “contract” with a “coven,” which is a group of witches (male or female). The group of witches who controls all the churches of the world are the Dark Magicians! The process of baptism actually promises the body, mind, and soul of a new born child to the coven of a church, which is controlled by witches from behind the scene! If you go to church, you may want to really think about that before agreeing to a covenant. Baptism is nothing more than a dark magic spell to trick parents to give up their baby’s body, mind, and soul to the Dark Magicians and their demonic masters. Since you now know the real reason behind baptism, you might want to not baptize your new born. Even better, just stay away from all churches because they are all controlled by the Dark Magicians, especially the Roman Catholic Church. When you go to school for the first time in your life, you are taught the alphabet, which is made of letters that are designed using sacred geometry. These letters are ideograms which are written symbols that represent ideas. One very important thing you need to know about all written symbols is that they are created into existence from the egg (the dot) and the serpent (the line). The egg and the serpent are important symbols in the religion of secret society. After learning the alphabet, you are taught how to “spell” using the letters of the alphabet. This is to prepare you for the day you can cast magic spells through the use of spelling! Did you notice that “magic spell” and “spell-ing” have the word “spell” in them? This is no accident. It is right in your face! The hidden intent of spelling is to cast magic spells. Most people are too ignorant (lacking in knowledge), so they have no idea what they are actually doing when they yell harsh words at one another using swear words or “curse” words. They did not call them curse words for no reason. Are you starting to see the big picture? Why do you think most parents tell their kids to stop “cursing” when they swear too much? Even at a subconscious level, we intuitively know that it is not good to use curse words too much. Maybe next time we should listen to our intuition and do some research to find out why we feel that way. The main reason why they teach you how to spell words correctly is to make sure that each letter or geometry is arranged the same way every time you write something. This will help strengthen the magic effects of certain words. After learning how to spell words, you are taught to “cast” those “spell-ings” into sentences, phrases, and ideas without teaching you about their magic effects. The purpose of this is to prevent you from knowing the true intention of language, so that the Dark Magicians can control your mind using magic spells. Their magic spells cannot control 100 percent of your mind, but they do affect your mind more than you may realize, just like how subliminal messages can affect your subconscious to a large degree. By now, you should know what I mean when I said early that nearly all words in the English language are carefully designed and put together by the minions of the Controllers (the Dark Magicians) to trick you into playing their “con game.” Most other languages are also created for this purpose. Your awareness is one of the most powerful spiritual powers that you have. Learn how to use it wisely and the Dark Magicians will not be able to control you. To learn how to use the power of your awareness wisely, you need to learn the right knowledge. With the right knowledge, you can increase and strengthen your awareness. For more information on how to do this, read my empowering article titled How to Expand Your Awareness. Do You Want More Information on Magic and the Power of Words? If you like this article, my book titled Word Magic: The Powers & Occult Definitions of Words should be of great interest to you. If you are interested in deep esoteric knowledge, my book should satisfy your desire for occult (hidden) knowledge.